One of the best colour options in my opinion Cardinal Red. Very early model with the white and shark grey Carla Check interior Trim, along with the dark grey perforated headlining and 7Jx13" Capri Pepper pot alloy Wheels. Would of thought the car had left the factory with a 4 speed box as the Carla check trim was dropped in 84 along with the 4 speed box. 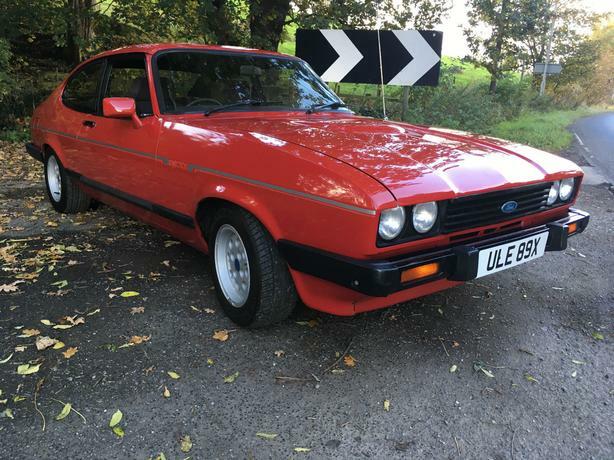 However this Capri does seem to have the 5 speed type 9 gear box from the later cars whether its been modified or its a factory fit box I'm unsure. Clocks read 47k. I cannot verify this being genuine, could be 147k but use your own judgement. There is no service history present. Nor is there any mot history online. Car has recently had 4 brand new Tyre's fitted . Very good strong car under the bonnet, all original strut tops and bulkhead. Engine pulls very strong & smooth. Car is also very tight and holds the road. Only bad points I can pick up on are the sunroof has some blistering and requires a little paint, parcel shelf missing, and owing to the car being lowered, the exhaust catches the speed humps!